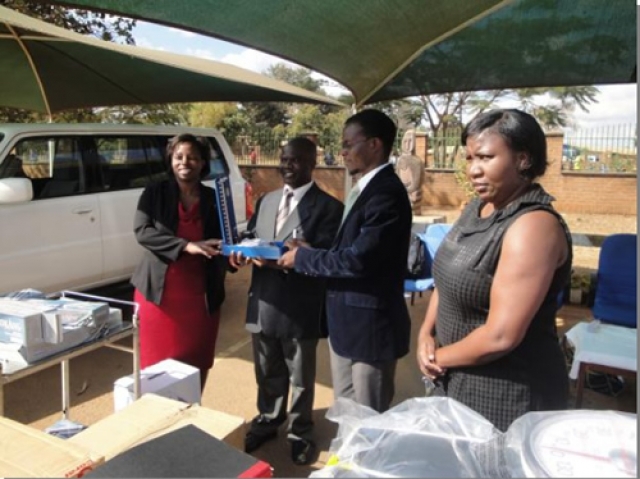 On 31 July 2012 the World Health Organization handed over diagnostic equipment and drugs worth, 1.2 million Malawi kwacha to Kasungu District Hospital. This support is for the implementation of the WHO package for essential noncommunicable diseases (WHO PEN) for primary health care in low resource settings. Handing over the equipment to the ministry, the WHO program officer for Disease Prevention and Control, Dr Kelias Msyamboza explained that the WHO is supporting the Ministry because there is profound evidence that noncommunicable diseases (NCDs) are a burden to the health care system in Malawi. “We have the evidence that was established through the NCDs STEPS survey that the Ministry of Health conducted together with WHO in 2009. Over 90% of Malawians that have high blood pressure do not know that they have the condition. In addition over 5% of Malawians have raised fasting blood sugar, an indicator for diabetes. It is in this context that we are providing the blood pressure machines, weight scales and tape measures, glucometers for measuring blood sugar and drugs for treatment and care of patients,” Dr Msyamboza said. Receiving the drugs on behalf of the Ministry of Health and handing over to Kasungu District Hospital, the Program Manager for the newly established Non-Communicable Diseases and Mental Health Unit, Dr Beatrice Mwagomba said that this support was timely as the Ministry has now prioritized NCDs in its Essential health package. “Until last year the Ministry of Health did not have a program to address NCDs and mental health. We all know that infectious diseases such as malaria, tuberculosis, HIV and AIDS have established control programs. This means that the handover ceremony here today is a milestone in the prevention, treatment and care of non-communicable diseases in the country as we health workers will enhance screening and early diagnosis of the major NCDs,” Dr Mwagomba said. She went on to explain that the NCDs are largely preventable by means of effective interventions that tackle shared risk factors, namely: tobacco use, unhealthy diet, physical inactivity and harmful use of alcohol. In addition, improved disease management can reduce morbidity, disability and death, and contribute to better health outcomes. In his remarks the District Health Officer, Dr Jerome Nkambule thanked both the WHO and the MOH headquarters for deciding to pilot the WHO PEN in Kasungu. “We will start conducting outreach clinics soon and from now we will be more focused because this support has just stirred the fire in all of the staff here at Kasungu District Hopital,” Dr Khambule said. The WHO Package of Essential Non-communicable disease interventions for primary health care in low and middle settings is an innovative and action oriented response to providing care to the poor who live in an environment where there is a weak health system and where the out of pocket expenditure for health services is unacceptably high. The WHO PEN utilizes approaches to reduce the NCD burden in low and middle income settings and it includes population wide and individual interventions. The interventions include early detection of NCDs and their diagnosis using inexpensive technologies, non-pharmacological and pharmacological approaches for the modification of the NCD risk factors and affordable medications for prevention of heart attacks and strokes, diabetes cancer and asthma. The Ministry of Health in Malawi has adapted the WHO PEN diagnostic, treatment and health promotuion tools (algorithms) to aid health workers in the management of NCDs. 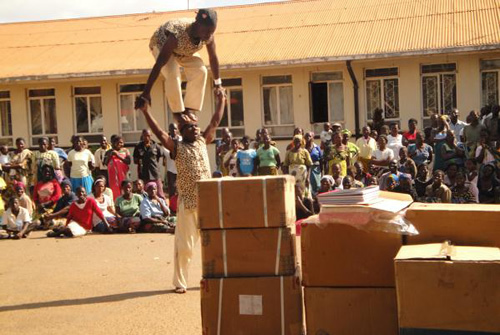 The piloting of WHO PEN in Kasungu help to generate adequate evidence that will assist the Ministry of Health to scale up the interventions to other health facility settings.